When it comes to high-level, specialized arthroscopic treatment for sports injuries in the Birmingham, Alabama area, referring physicians and athletes of all levels turn to the providers at Powell Orthopedics & Sports Medicine. Dr. Thomas Powell performs arthroscopic surgery on the shoulder and elbow, knee, and ankle for bones, cartilage, tendons, ligaments, and muscles that have been injured during sports activity. Arthroscopic surgery is an advanced surgical technique that allows orthopedic surgeons to see inside a joint without having to surgically open the joint. Arthroscopy is used for diagnosing and treating many sports injuries and orthopedic conditions. The diagnostic capability of arthroscopy is highly precise for damage to the bones, cartilage, tendons, ligaments, and muscles that make up a joint. Arthroscopy is a far less invasive procedure than traditional open surgery. Guided by a miniature viewing instrument, or scope, arthroscopic surgery requires only a few small incisions. An arthroscope contains a lens, lighting system, and camera that allow an orthopedic surgeon to view magnified images on a video screen or take photographs and record video. The doctor can also perform surgery by inserting thin instruments through the scope. Arthroscopy is associated with a decreased risk of infection, faster recovery, and less pain, bleeding, and swelling. 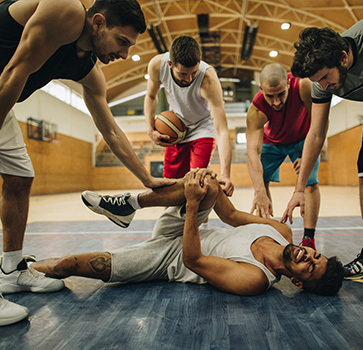 Whether you're a weekend warrior, amateur athlete, or professional athlete with strains, sprains, pulls, tears, or even fractures, our providers will help you return to your game as soon as possible with the most sophisticated arthroscopic surgery. For an urgent need sports medicine appointment, call (205) 877-9191 or request an appointment online for non-urgent appointments at Powell Orthopedics & Sports Medicine in Birmingham, Alabama.